My co-teacher and I have been fortunate enough to have been a lab classroom for our district again this year. We had approximately 50 teachers from around the county come in to our classroom and observes both our practices as well as the daily work of our students. After each day's observation has been completed, we spend roughly 30-45 minutes debriefing with the observers so that they can better understand strategies we have in place or why we do certain things the way that we do. It's interesting to hear how various themes tend to arise each year. This year, common topics of conversation seemed to be Word of the Day, level of student engagement, and student independence. As I was mulling over this particular blog post in my mind, I had a difficult time deciding whether it would focus on a strategy a student used or the independence of our students. There is so much overlap with those two particular ideas that I find it almost impossible to delineate. Therefore, I won't. A student came to me the other day clutching Lynne Kelly's Chained. "Mr. O'Neill, I don't understand Timir. I can't figure out if I like him or not." Have a seat, let's talk. Now, during debriefing teachers frequently ask us when and how we know to confer with a student. We are readers ourselves, and while too many currently believe that reading is an independent activity, we know that conversation is the ladder that raises readers. When I finish a book, I need to find a friend with whom to hold a conversation. I need to hear their thoughts to better understand my own. Additionally, we want our students to be able to identify when a breakdown is occurring and to be able to develop possible solutions to that breakdown. When we confer, we don't force strategies upon them. We simply attempt to ask the right questions. When this particular student was trying to wrap her mind around Timir, it was because his behavior was beginning to change. I placed sticky notes in front of her. "What did you think about Timir when you first met him?" "What do you think of Timir now?" 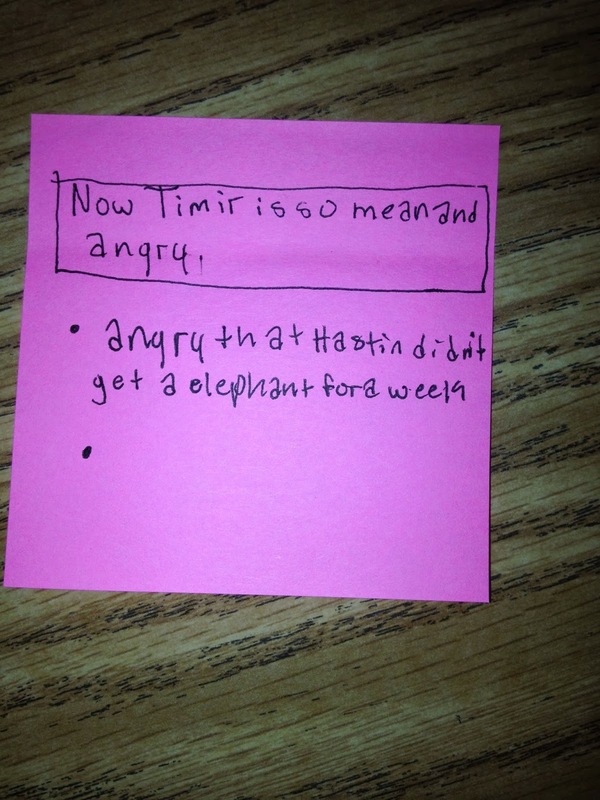 From there, she now had a better understanding of who Timir was. We discussed his motivation and his manipulative, selfish ways. I wish I had a picture of her face as she realized similarities between Timir and Scarface (the antagonist from Boys Without Names, a book she had read previously in the year). Getting back to engagement and independence, she left our conference hungry for more. You'll notice that her claim of "Now Timir is so mean and angry" has one bullet point completed, but one left intentionally blank. That support was not for her to complete while we were together, but for her to continue reading and add to her thinking as she continues to learn more about Timir and how Lynne Kelly has chosen to develop him throughout the course of the plot. As teachers, we don't need to have all the correct answers. We simply need to know how to ask the right questions; the questions we would ask ourselves so that we can help build readers, writers, and mathematicians. We need to build problem solvers who are then able to process through their own thinking by asking themselves the right questions. This is why our students are engaged and driven. We're not doing the thinking for them. 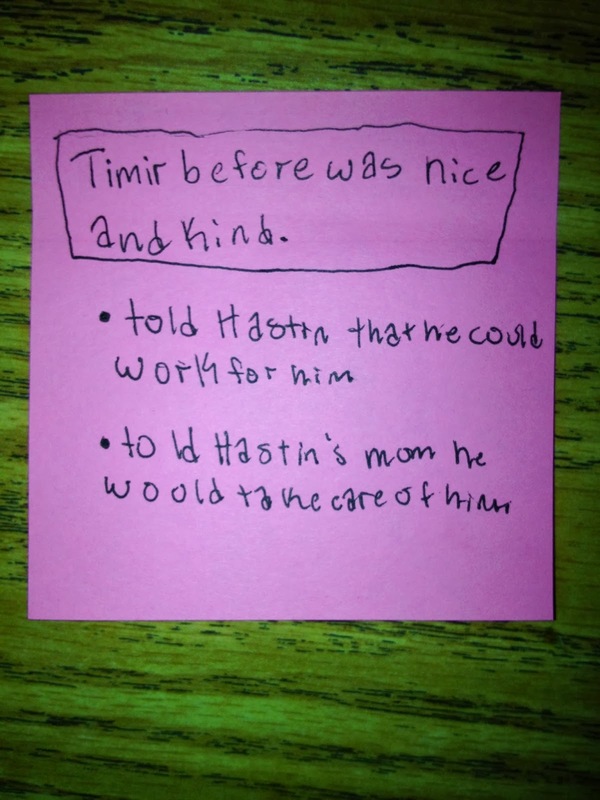 Fascinating-- I never thought anyone would like Timir at all, so I love that this student found some good qualities in him! Sounds like a smart reader, making connections to other characters she's read about. And what a wonderful classroom to be in, where students are encouraged to think about what they're reading and discuss their questions! Thanks so much for reading Chained and sharing your thoughts about it. 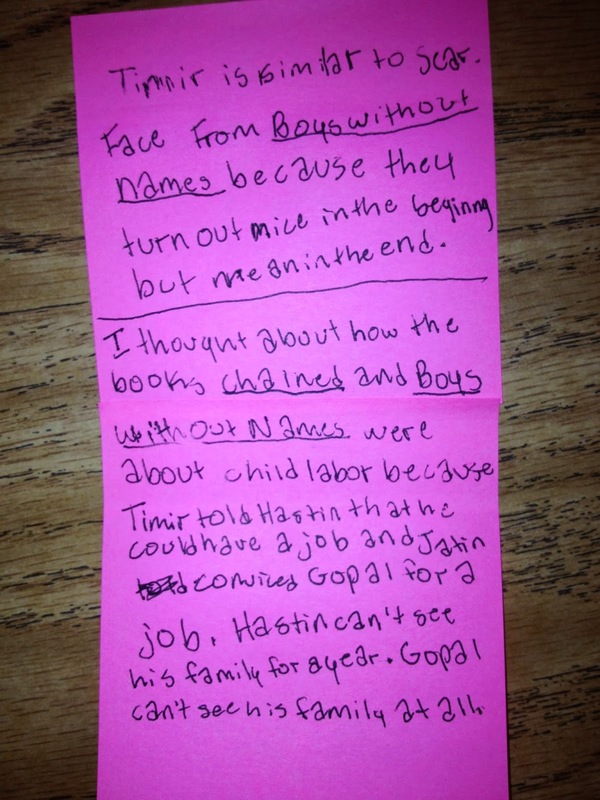 I shared your comment with our class and I wish you could have seen their reaction. They were beyond excited to see that you took the time to value their work. Many thanks for both your writing and for taking time out of your schedule to appreciate our incredible students!